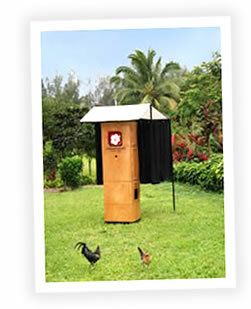 Our portable photobooth is awesome entertainment – anywhere people are looking great and up-for-fun! Real photos - real fast. Right: The Island Booth – chickens not included. Add extra punch to your next event with our photo booth event hire packages. Our hourly photobooth hire packages include set-up, operator, personalised photo strip design, and a USB of all the full-size photos. Find out more about our photobooth hire package pricing. Rarotonga is a popular wedding, conference, sporting and cultural destination, and there is only one Island Booth! You’ll need to check that your date is available and have a 50% deposit handy. We recommend booking as-soon-as-possible :).